How many bones in the human body ? is a common question and required knowledge of students taking many courses in subjects such as human biology, human anatomy & physiology and health science subjects such as nursing and various therapies. There are 206 named bones a normal, complete, adult human skeleton. However, individual people / skeletons can have more than 206 bones including various small un-named bones that have formed, typically in high-friction areas of the body. Bones of the human body can be classified (i.e. grouped or described) as the axial skeleton and the appendicular skeleton. It might be easier to learn the names of the bones of the human skeleton in these two groups than to try to remember one list of 206 human bones. Due to the symmetry of the face, most of the facial bones are in pairs - one on each side of the face. Exceptions include the vomer (in the nose) and the mandible (lower-jaw bone). Only distantly articulated to other bones by muscles or ligaments - no joints with other bones. 3 bones located in the middle ear on each side of the head - smallest bones in the body. incl. the atlas and axis bones located in the neck. Most of the vertebrae are usually referred to by numbers rather than names. The sternum is also known colloquially as the 'breast bone'. The symmetry of the body is such that there are 2 clavicle bones and 2 scapula bones, one on each of the left and right sides of the body. The two upper limbs have symmetrical bone structures, hence the list of even numbers of bones for each name / category of bone listed. E.g. (1.) 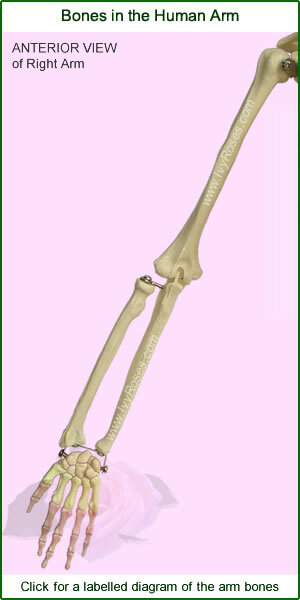 there is a humerus bone in both the left- and right- arms - see bones of the arm. E.g.(2.) there are 10 metacarpal bones; 5 in each hand. These could be listed individually as metacarpal I, metacarpal II, metacarpal III up to metacarpal V on each of both the left- and right- hands. See bones of the hand. The hip bones are also called the 'coxal bones' and have 3 parts: ilium, ischium and pubis. The two lower limbs have symmetrical bone structures, hence the list of even numbers of bones for each name / category of bone listed. E.g. (1.) there is a femur bone in both the left- and right- legs. E.g.(2.) there is a cuboid bone, which is one of the tarsal bones, in each of the left- and right- ankles. There are 80 named bones in the axial skeleton. There are 126 named bones in the appendicular skeleton. Therefore, there are 80 + 126 = 206 named bones in the human skeleton. What about the un-named bones in the human skeleton ? How many un-named bones are present and where are they ? Sesamoid bones and sutural bones are mentioned on the page about the different types of bones in the human skeleton. Sesamoid bones develop in some tendons in locations in the body where there is much friction, tension, and physical stress e.g. in the palms of the hands and the soles of the feet. Sutural bones are tiny un-named bones found only within the sutural joints between cranial bones (a 'suture' is an immovable joint whose only location in the human body is between the cranial bones of the skull). There are many sutures, the most prominent being the coronal suture, the sagittal suture, the lambdoid suture and the squamous suture. Apart from the patellae (also known as 'kneecaps'), which are the only named sesamoid bones in the human body, the number and location of sesamoid and sutural bones in the skeleton varies considerably from person to person. It may also change over a person's lifetime e.g. if someone changes from having a sedentary lifestyle to one invloving much manual labour and, as a result, develops additional sesamoid bones in his hands. So, how to answer the exam question: How many bones are in the human body ? Take into account the maximum number of marks available. If only one mark is available for that part of the question, the expected answer may be short and simple, e.g. "206 named bones". There is no need to name or list all the bones or to label them on a diagram unless asked to do so. In the cases of longer questions e.g. including several parts and with more marks available, credit may be given for distinguishing between named and un-named bones and explaining that the minimum number of bones in the human body is 206, which is the total number of named bones. This is the end of this page about How many bones are in the human body ? See also the structure and functions of bones, the human skeleton, types of bones, cranial and facial bones, bones of the feet and hands, bone markings and skeletal disorders.